"marked by decay or decline"
Accusations of losses on electricity exports, and government denial of the fact, is far from news, but the reappearance of the topic in Ontario's legislature demands it be reviewed anew. Energy Minister Glenn Thibeault...says Ontario made $230 million in 2015 by selling excess electricity to neighbouring jurisdictions. Thibeault says Ontario suffered through power shortages and brown outs when the Conservatives were last in power, and had to spend up to $500 million a year to buy electricity from its neighbours to keep the lights on. I wrote on the costs to Ontario ratepayers of cheap exports almost 6 years ago, in rebutting the same spin as the Minister delivered yesterday when presented by a previous Premier. Later, in 2013's Ways to estimate Ontario's losses on electricity exports I demonstrated multiple methods to quantify losses on exports. The estimates of losses vary by methodology and assumptions, but if methods are applied consistently all indicate increased costs to Ontario consumers from producing far more electricity than necessary to meet their demands . I won't revisit all the arguments I've made in the past, but instead tailor a response to the rookie Minister's old denials, emphasizing how poorly he is prepared to undertake the task of developing a plan for the sector. The numbers in PC leader Brown's questioning, quoted above, come from my friend Parker Gallant's blog post, The lesson of November 10: cancel the contracts Minister Thibeault. Parker has been remarkable in maintaining his workload displaying the mistakes of the government on electricity, particularly on industrial wind turbine policies. A while ago I tried to build a coherent daily report with Parker in mind. For November 10th, my report estimating costs showed an average supply cost of $96/MWh, with revenues on export sales of $2/MWh. On exports of 63,071 MWh this implies a loss of just under $6 million. This "average cost" approach is less confrontational than the figures laid out by Parker, but, as I'll now show, it's not more valid. Minister Thibeault is tasked with producing a "Long-Term Energy Plan" (LTEP) for the province. Ontario Hydro's net export revenues - the gross revenue less the estimated incremental cost to the utility of generating and transmitting the energy - are shown in Table 7.5. 11.2 The Ontario government should continue to support Ontario Hydro's efforts to utilize its surplus generating capacity by undertaking interruptible or firm sales to neighbouring utilities that are both profitable and in the best interests of the people of Ontario. "in the best interest of the people"
...we are an exporter, and the net benefit of those exports to ratepayers was $230 million in 2015. In August, the Ontario electricity market generated net export revenues of $14.8 million. This is based on export revenues of $35.4 million minus imports of $20.6 million. That release pointed to a long-dead link, http://www.ieso.ca/imoweb/siteshared/imports_exports.asp. The page showed energy imported and exported, as well as cost. For August 2012 it would have shown the $35.4 million in export revenues came from selling 1.194 million megawatt-hours (MWh) of electricity. Because the IESO is no longer a model of transparency, I'll have to guess that the $230 million for 2015 is calculated in the same manner as 2012's transparent IESO. That being the case, the $230 million, on net exports of 16.8 million MWh, means $13.65/MWh - but this is distorted. A truer figure is not on net exports but simply exports: valuing 2015's 22.6 billion kilowatt-hours of exports at the Hourly Ontario Energy Price, the total receipts are estimated at $475 million, making the average price 2.1 cents/kWh ($21/MWh). The Minister of Energy disregarded both his constituents and intelligence when he stood in our legislature and lied that "we made $230 million" made selling 22 million megawatt-hours, as the sales were made averaging a loss $62 on each megawatt-hour (using an average cost methodology). The total loss on 2015's exports would have therefore been $1.364 billion - which is a big part of the reason residential and small business consumers paid more than the average $83/MWh procurement cost: $101/MWh. The subsidizing of exports by Ontario ratepayers was a major factor in pushing the cost for residential and small business consumers a full $18/MWh above the average cost of power indicated by the IESO. 2014 is the only recent year we have good summary data for - due to Figure 5 of a report from the Office Of the Auditor General of Ontario. That report showed $380 million in net revenue, with an average revenue on exports of $33.3/MWh (on exports of 19.3 million MWh). Still a net loser, but it was surely better than 2015 which is far better than 2016. This year will end with Ontario exporting about 80% more megawatt-hours than it did in 1979 (according to the above chart), for about the same nominal revenue. Let me repeat that, so you could treat Minister Thibeault's future words with the appropriate level of respect: in 2016 Ontario will export about 80% more power than it did in 1979, for the same total revenue, calculated without any adjustment for inflation. Is this because, as Minister Thibeault says, of investments made "to ensure that we don’t have to import electricity."? An indication this is not so is Thibeault's government just recently announced a commitment to import 10 TWh from Quebec over the next 5 years - and while there was essentially no disclosure of terms in Ontario, Quebec's press reported a cost of $50/MWh. The Minister is firmly stating the government didn't need to do what the government just did. Maybe the government has invested so it doesn't have to spend $500 million on imports, but it's now guaranteed it do so anyway. Interconnections tend to reduce the severity of major contingencies caused, for example, by extreme weather conditions, common mode outages of generation and transmission equipment, strikes, and fuel shortages. This was clearly demonstrated during the extremely cold winter of 1976-7 when, combined with mechanical problems at the Nanticoke G.S. and low water conditions in northern Ontario, Ontario Hydro was forced to buy large quantities of power from U.S. utilities to ease the situation in Ontario. 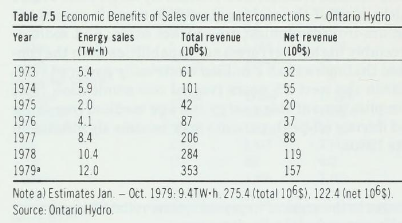 The economic and political desirability of Ontario Hydro's export potential is exemplified by the electricity sales to Michigan during 1977-8. These sales involved both capacity and economy power. During the period of maximum sales, Michigan utilities were suffering from a strike in the coal industry and unusual equipment malfunctions, and their system-expansion programme was behind schedule. However, it is considered that the factors that gave rise to the emergency were temporary. A temporary period of high import volumes is a good argument for ties between systems facilitating trade. Picking one single year can't indicate a systemic shortage unless one doesn't believe in either efficiencies from trade, or that temporary supply shocks occasionally arise. Conversely, picking 9 consecutive years is pointing to a systemic failure. I've found annual data back to 1935 from either Statistics Canada or the Ontario Royal Commission of Electric Power Planning (a.k.a. the Porter Commission). This data is not ideal: I don't consider Statistics Canada a reliable source of electricity sector data (knowing it to be particularly bad on embedded generation), and I adjusted the Porter Commission data to match the Statistics Canada data for years both were available. 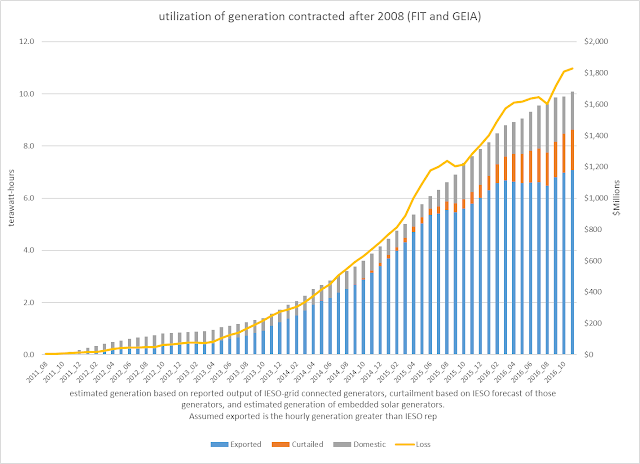 While the demand for generation graph is compelling, I also ask you note the blue bars indicating estimated net exports. Including 2016, 9 of the 10 highest net export years are the past 9 years. The graph shows the big drop in demand in 2008, which coincided with the abandonment of professional electricity system planning in Ontario. The Green Energy act, which ended integrated power system planning to prioritize renewable generation, was allegedly intended to revitalize the province. What it did do is facilitate contracting a tremendous amount of variable renewable energy sources (vRES) at exactly the time the Ontario electricity market least needed any. 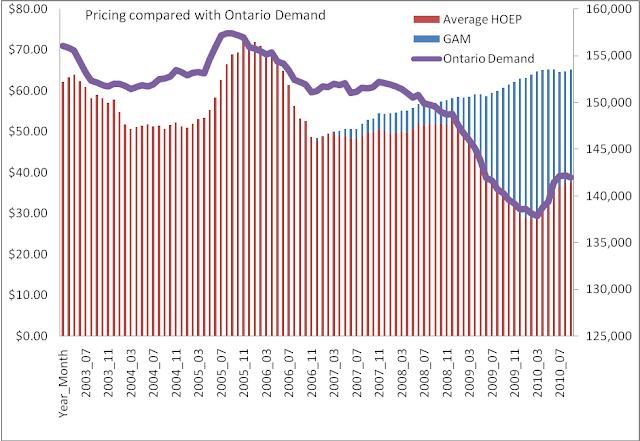 My first blog post on my first blog included a graph showing the market price declining in relation to falling Ontario demand after 2005, which is a market signal for less supply. 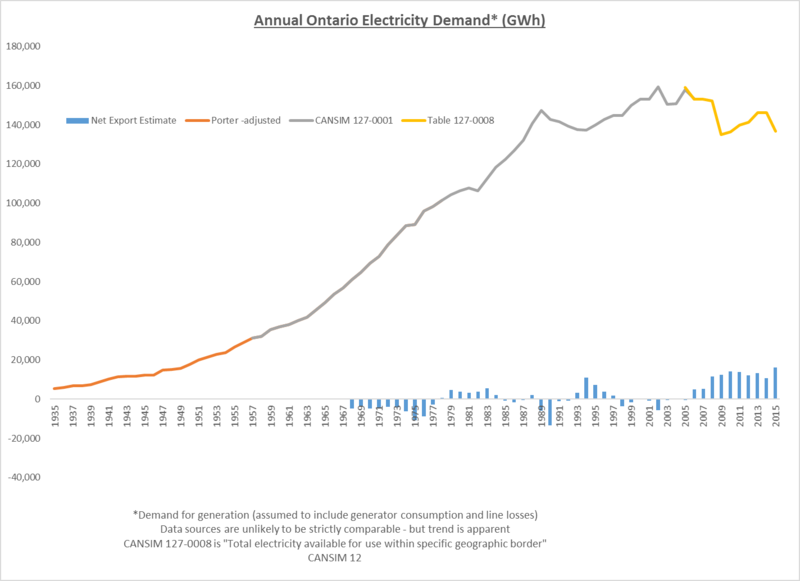 In 2008 Ontario set a record for exporting electricity even as demand, and with it market pricing, was plummeting. Despite the obvious economic situation, between 2008 and July 20, 2011, the province contracted some 3,913 MW of wind capacity and 1505 MW of solar. July 20, 2011, was the day Parker Gallant and I had our first collaboration, Power Dumping, printed in the Financial Post - it came 16 days after what turned out to be the final major announcement of feed-in tariff (FIT) contracts. Between July 2011 and the announcement of competitively bid contacts in March 2016, the amount of wind contracted changed very little, although in the absence of reporting on embedded generators that would have exposed the rapidly growing cost of solar, other contacts continued to be written, albeit at a much slower pace. Because these post-Green Energy Act (GEA) contracts of wind and solar provide the most expensive electricity in the Ontario market, if the IESO's pretend market selected generation with actual cost as the basis of the merit order selection, this is the power that would not be generated. It is entirely fair to treat this, the most expensive power in the province, as the power that is being dumped in export markets. I return to November 10th, and how much money I estimate was lost on exports due to the Green Energy Act and contracting done after 2008. Ontarians paid approximately $9.5 million for the output of these new generators, for about 38,000 megawatt-hours of supply to grids, and approximately 16,000 megawatt-hours of potential supply that had to be curtailed. The market valuation of this supply, as per the Hourly Ontario Energy Price, was about $86,000. At no time was the output from these generators greater than exports - meaning all of this most expensive, most recently contracted, and least reliable supply was dumped on export markets, or curtailed, at a total loss of about $9.4 million. This expense, which hits Ontario ratepayers as demonstrated by record rates in November, is primarily due to a predecessor to Minister Thibeault, George Smitherman, former Premier Dalton McGuinty, and the another Energy Minister of Energy during the period of reckless renewables contracting - Thibeault's current Cabinet colleague Brad Duguid. Applying the same logic to all dates as used in calculating the $9.4 million Novermber 10th loss, I estimate the high cost of contracting expensive variable intermittent supply after the steepest demand drop in history and corresponding highest annual exports in history. The following is a graph of the 12-month running total utilization of post-2008 contracted supply, and the losses, after export revenue, on that mostly wasted supply. Over the past 12 months the losses average about $5 million a day. Over the past 5 years losses on reselling, or curtailing, supply contracted after 2008 has cost Ontario ratepayers over $4 billion. The current contracted bioenergy, wind and solar supply is about 8800 MW, of which I'd be surprised if 8000 MW enters service prior to 2018. I note this to point out that if not for the likes of Parker Gallant, prices would be higher today. The Glenn Thibeault that resuscitated the tired old Dalton McGuinty spin confusing sparse revenues on exports with profits is the same Glenn Thibeault tasked with creating the next Long Term Energy Plan. All should be aware he enters the process communicating ignorance of the consequences of previous Long Term Energy Plans from previous uneducated Ministers. 1. My suspicion is Royal Commission (a.k.a. Porter) report tracked metered Ontario Hydro consumption, whereas the CANSIM data was generation, including self-generation. The difference in 1957 was 25.6%, and I adjusted the Porter data up by this percentage right back to 1935. The last year with both values was 1978, and the difference had shrunk to 12.3% - which I feel could be reflective and transmission and distribution line losses, generator consumption and self-generation (behind-the-meter).